Whether the holidays drive you to drink or the drinks are just part of the fun of celebrating, this is a good cocktail recipe to have on hand. I received a sample of PAMA Pomegranate Liqueur and was interested in several ideas from the accompanying recipe booklet. A PAMA margarita or martini would have been nice, but the thought of pomegranate flavor with bourbon in a Manhattan was something I had to try. First I tasted a sip of the PAMA liqueur on its own, and it was very much like pomegranate juice. This is not a sweet or syrupy liqueur. The flavor is very well-balanced, and it adds nice color to a finished cocktail. 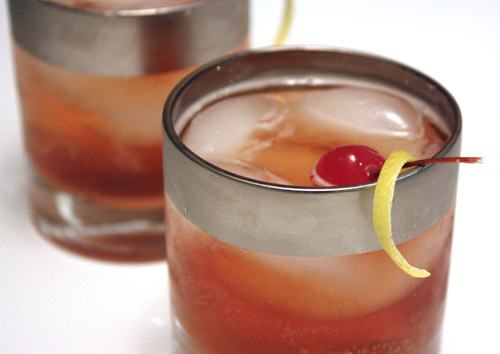 A classic Manhattan includes bourbon, sweet vermouth, and bitters and is garnished with lemon peel and a maraschino cherry. The recipe in the PAMA booklet, replaced the vermouth with PAMA, omitted the bitters, and added a splash of soda water. I decided to create a sort of hybrid mix of that recipe and the classic. A cocktail pitcher was filled with ice, bourbon, PAMA, and bitters were added, the mixture was stirred until chilled, it was poured over ice in two small glasses, and it was topped with sparkling water and garnished. I’ve always been a bourbon fan, and I was very happy with the way its flavor mingled with that of pomegranate. I used angostura bitters, and just a couple of dashes added a distinctive note. I can imagine a lot of delicious uses of PAMA liqueur, and I’ll definitely try the margarita eventually, but for a sophisticated twist on a classic cocktail this pomegranate Manhattan would be hard to beat. -Fill a cocktail pitcher with ice. Pour bourbon, PAMA, and bitters over ice, and add dashes of bitters. Stir until chilled. 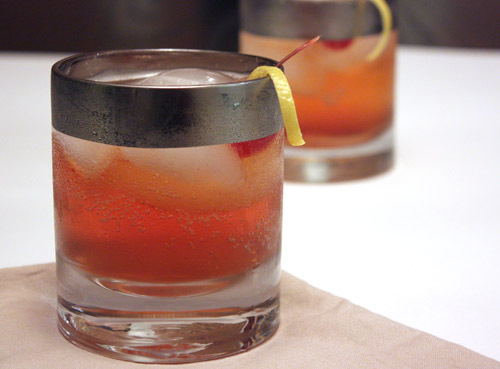 Strain cocktail into two small glasses with ice and top with sparkling water. Garnish each with lemon peel and a cherry. I have never had a Manhattan, but anything with pom makes me weak in the knees. Sounds interesting! Love the looks of this, absolutely stellar now if I only knew where I packed my lowball glasses, I'd myself one! A delicious drink with PAMA! I really liked PAMA, it's a delicious liqueur! I love cocktails and those rocks glasses are so lovely. Hope you had a nice holiday. Manhattan? Never had it? But this one wiht pomegranate looks delicious...cheers! Sounds like a really great drink. Your serving glass is very special! i've not seen the pomegranate liquor, but i'll bet it's tasty. great (and timely) drink, lisa! So delicious and so pleasing to look at as well. Sounds like a perfect happy hour cocktail! It's 5 pm somewhere, right? I would love to make drinks as pretty as yours. We usually drink lot's of wine during the Holidays. I had a lunch meeting at the restaurant, and I saw a bottle of this and thought...then I ordered a ginger-ale. I will have to try it soon, but after work is done ha! Not that the drink isn't great, but the glasses are terrific! Yummy! I have GOT to try that pomegrante liqueur. This looks so great and I love your glasses! The PAMA sounds just delicious! This is a wonderful drink for the holidays. This looks so refreshing. I am going to make it with grenadine. Cheers! I like a manhattan every once in a while! This looks particularly good! Lisa, I am so trying this drink. Fantastic! I'd really like one of these right now! I keep reading about PAMA and need to get my hands on some! I've been thinking about how I need to try a Manhattan, I think I've been better convinced by pomegranate being involved here.